Cascading Mountain Falls Outdoor Water Fountain with LED Lights, 53 Inch Tall | Fountain City Art Ctr. 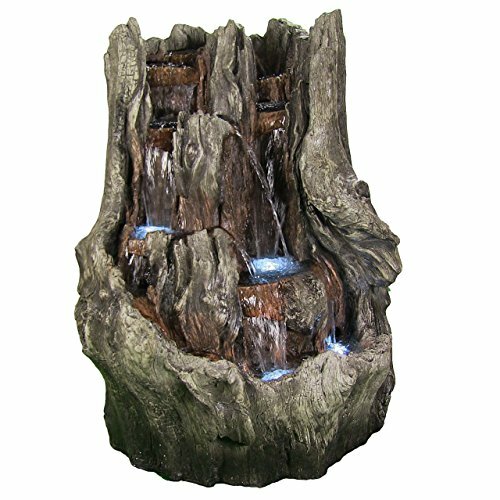 Whether you place this electric outdoor water fountain with LED lights in the garden, on the patio or on your deck, this fountain is sure to leave a beautiful lasting impression.The fountain is made from a durable polyresin and fiberglass material that is painted to look like a waterfall you might find in a forest. It is painted in colors of gray, green, brown and ivory and features 4 LED lights. The electric pump enables the gently flowing water to flow from the top tier all the way down to the bottom pool where it then recirculates back through the fountain. Overall dimensions: 39 inches wide x 53 inches tall x 32 inches deep, weighs 125 lbs. Features durable polyresin and fiberglass construction and LED lights located in the bottom 3 levels to illuminate the water flowing from the fountain. Conveniently includes two plugins, one for the lights and one for the pump so you can run both or just one. Jebao WP3500 Quiet submersible electric pump with 1" hose diameter and transformer for lights is included so you can focus on relaxing. *Colors may vary slightly from on-screen images. Computer monitor settings and different lighting environments can make product color appear differently.